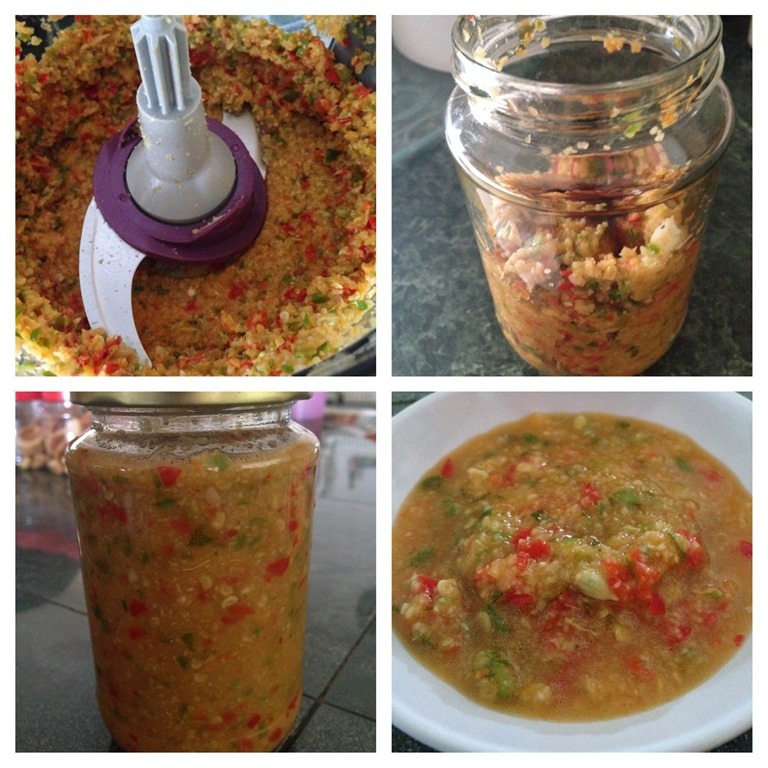 Updated on 20-9-2014 : The post was updated with the chilli sauce recipe. Please scroll down towards the end of chilli sauce recipe. This is one of my most satisfied posts and it went unnoticed because of the inexperience picture taking and poor formatting when I just started my blogs. I have decided to add in new pictures for this post. The post was originally written for Mother’s day 2013. However, it is equally applicable to any occasion. 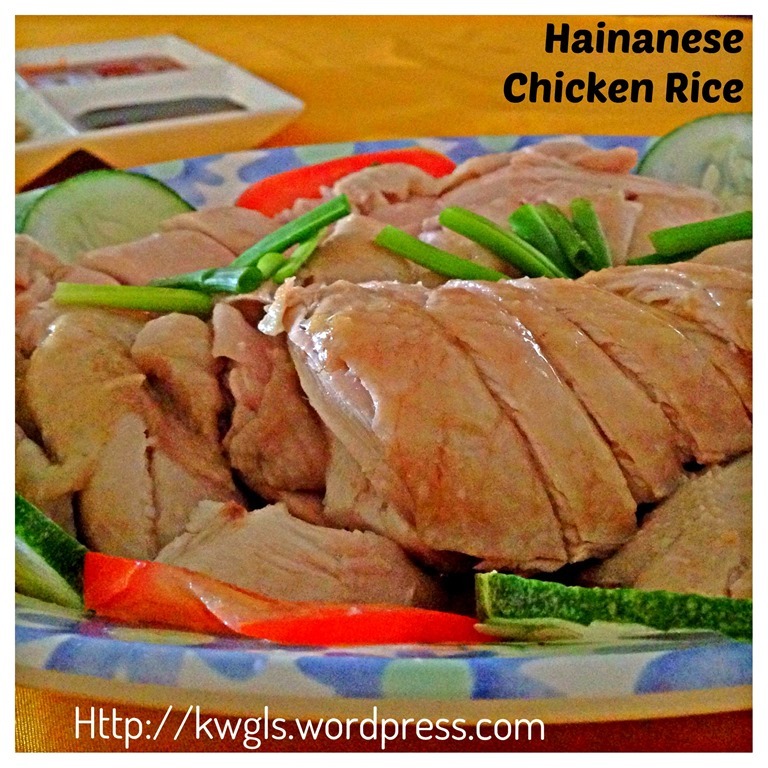 As explained above, chicken rice is a common household dish and hawker’s saleable item. It is welcomed by population of all age groups in Singapore and Malaysia, be it children, teens or adults and all levels from workers to top executives. Singapore is famous for its chicken rice (actually, I am not sure about the reasons behind this since places like Ipoh, Malaysia are also famous for their chicken rice) and is deemed to be a “national dish”. It is also one of the items served by Singapore Airlines for its business class and first class customers. 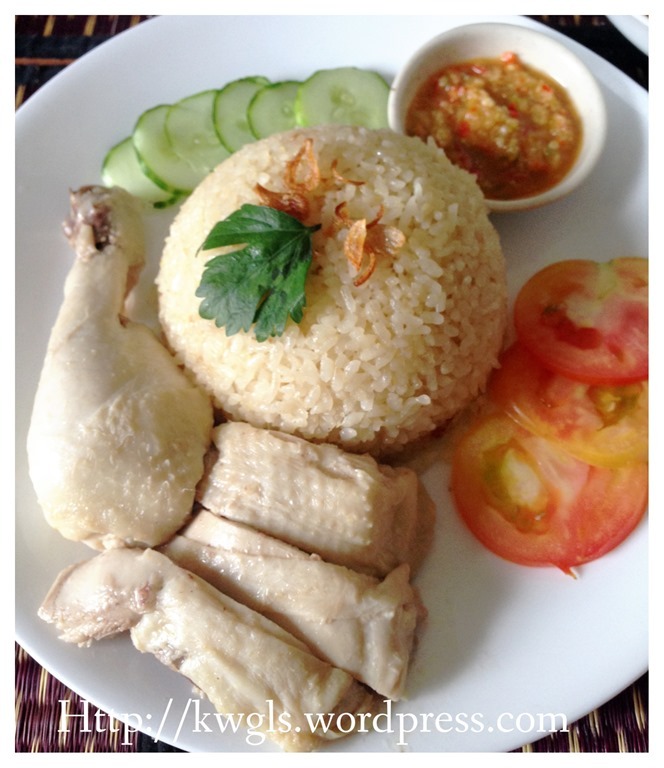 My kids loved chicken rice and I decided to cook chicken rice yesterday since they have been mentioning it for quite a while. In fact, they are having chicken rice at least one to twice a week at the school canteen. 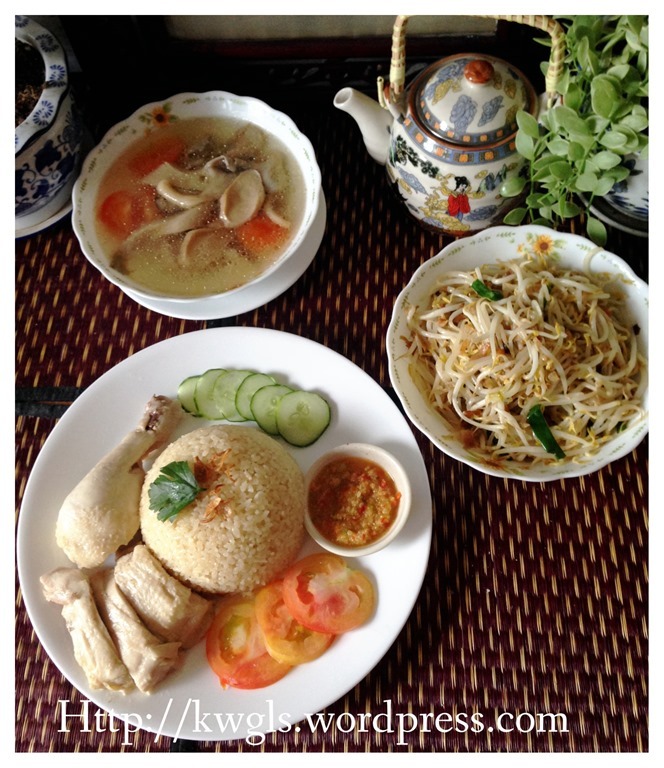 Chicken rice is basically “chicken” plus “rice”. If you are not fussy and able to forgo a lot of minute details in the dish preparations, you will score may be a pass in your preparation. If I am not having meals at home, my mother in law can cook a pot of chicken rice serving the whole family (2 adults and 2 kids; 2 women, 1 girl, 1 boy) with just two drumsticks. This was how she did it. 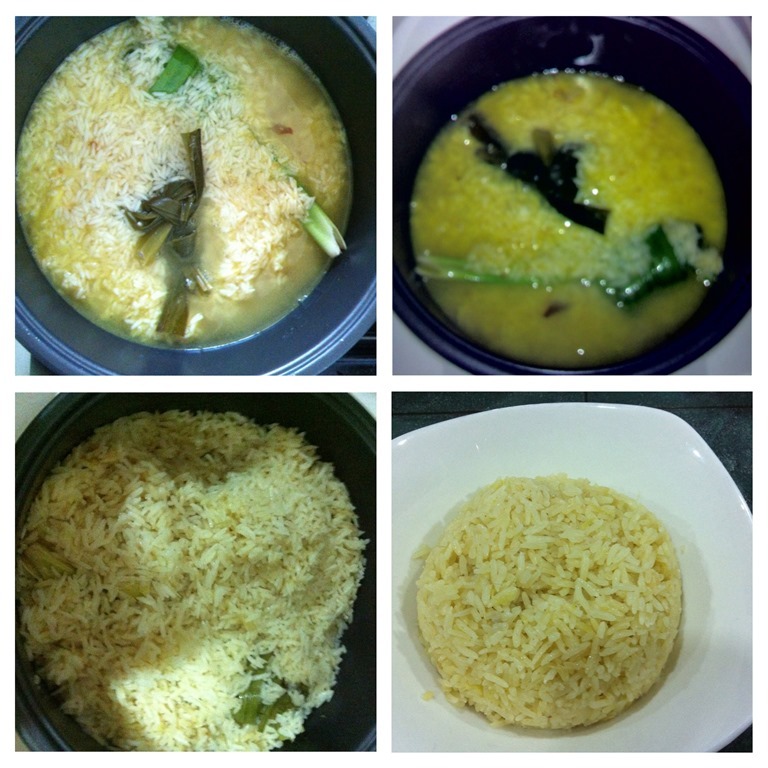 She cleaned the drumsticks; mixed the uncooked rice with a few spoons of chicken rice sauces sold in the supermarket; added a few sticks of pandan leaves; put it in the rice cooker; put the drumstick on top of the rice and on the rice cooker. This is a super quick way to cook, my mother in law was using the steam generated from cooking the rice to cook the chicken and let the juices dripped into the rice. It took her only 20 minutes to cook. There was no complains from her daughters and grand children as the three females family members don’t really like to consume meat. They just want “chicken-rice flavoured white rice” and they are more than happy to give all the drumsticks to my son. HOW BRILLIANT IS MY MOTHER IN LAW! However, if you and your family members are food critics, then you may take a while for you to prepare an entire dish until the level acceptable by the foodie. 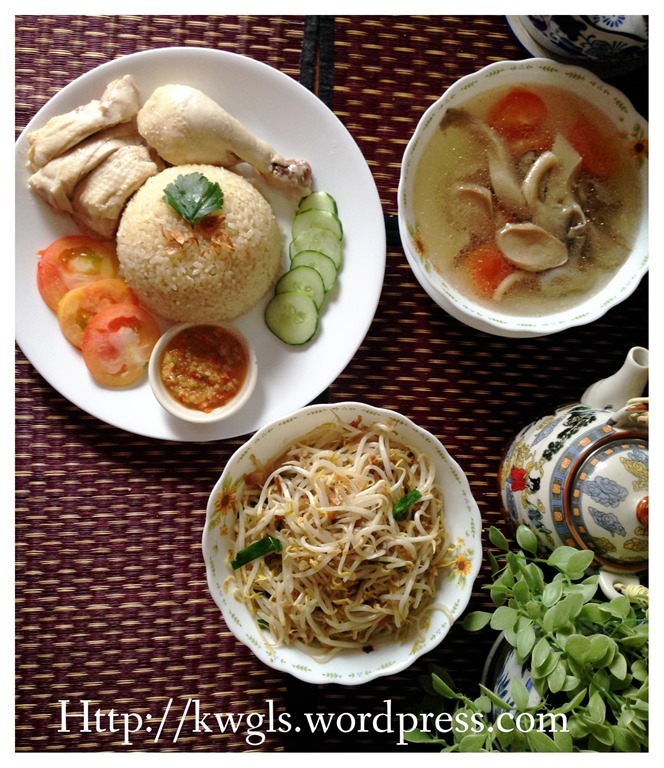 The next question would logically be what differentiates a plate of delicious chicken rice from the “yucky” one. 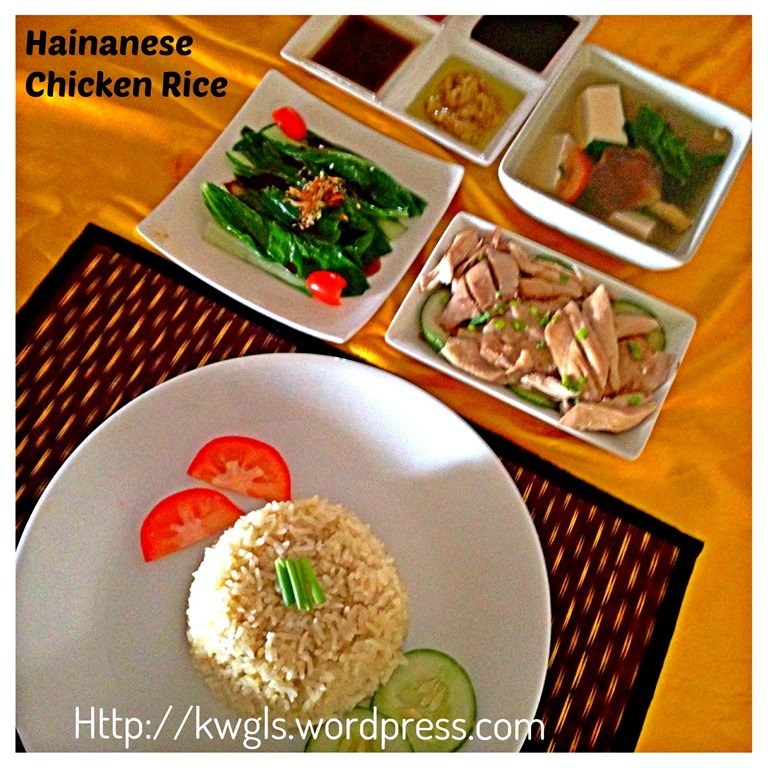 WHAT CONSTITUTES A GOOD PLATE OF CHICKEN RICE ? Texture The rice should be soft but still maintain the original grain shape. It should not be soggy (meaning too much water added) and greasy. Colour Colour should be slightly yellowish that and not plain white. 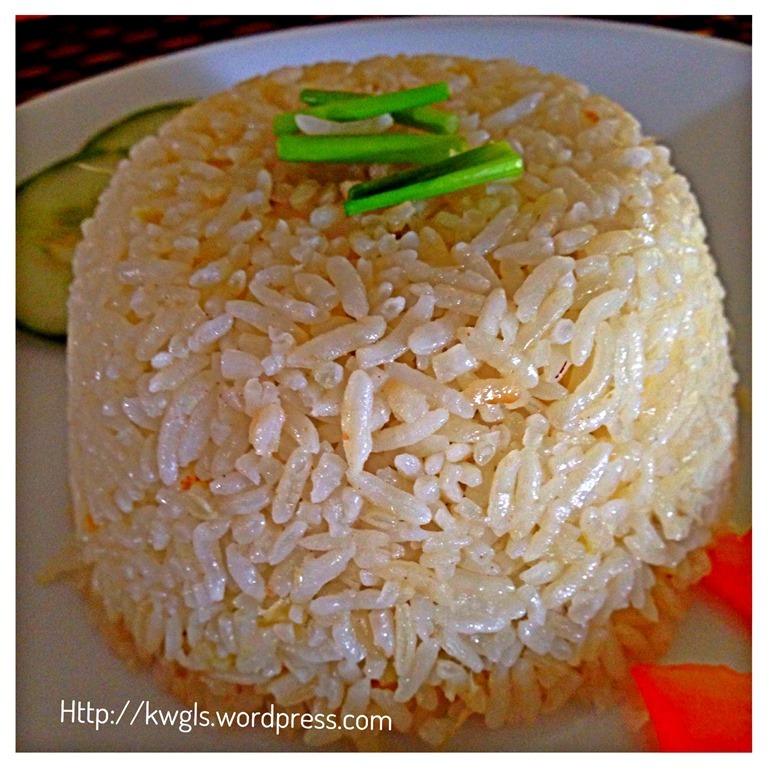 Yellowish colour make the rice looks more presentable and appetizing. Texture Should be soft and juicy. 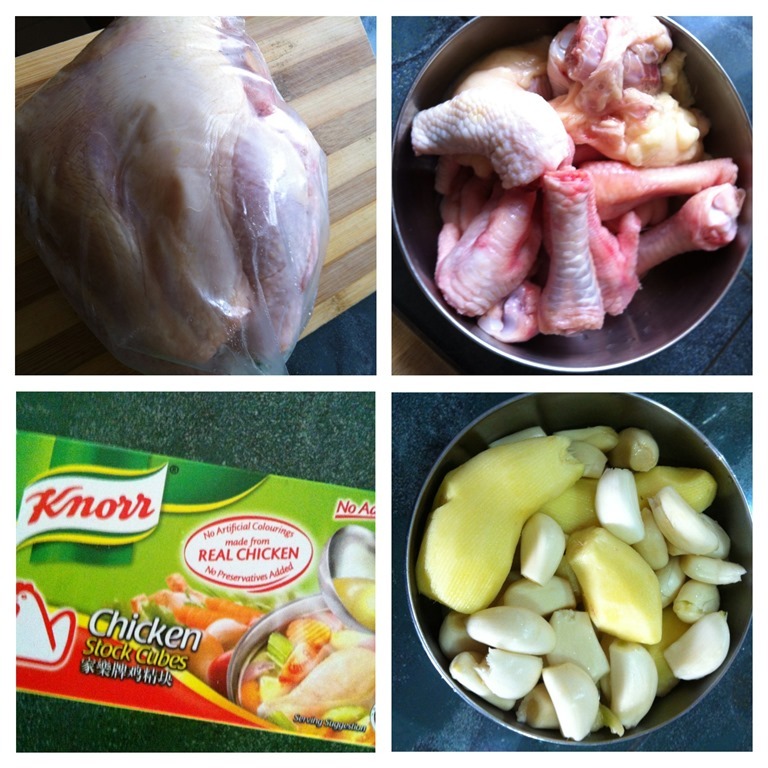 Therefore, simmering/poaching of chicken is one of the critical processes in this dish preparation. Appearance A bit glazy, skin should not be broken. However, most household will throw away the skin and debone the chicken before serving it. Chilli sauce Beside spicy, chilli sauce must also have the fragrance of sesame oil, ginger, garlic and lime. Before I proceed, I have to caution that my recipe is the healthy version but the outputs resemble those chicken rice sold in hawker centres or posh hotels or restaurants. You got the hint? If you found my ingredients are not that healthy, just substitute with what you usually use. Of course, not the chicken and rice!!! I will justify the usage of my ingredients. One medium sized chicken. 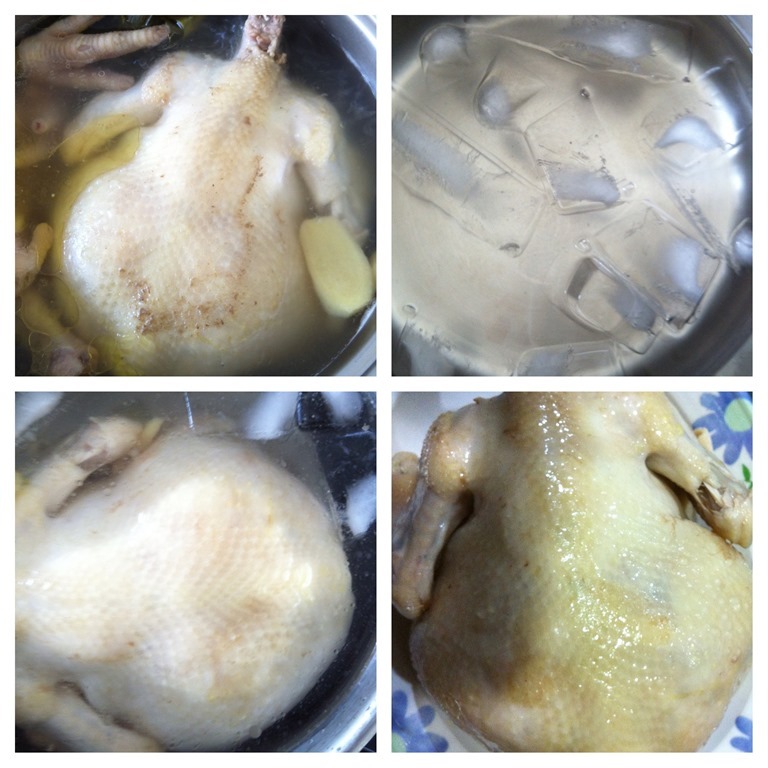 – When you buy the chicken, you have to ensure that you have a pot big enough to submerge the whole chicken. I have used a smaller chicken because I only have 4 persons for the meals. For your reference, I have paid SGD 4.80 for chicken, therefore, it is rather small. I do not recommend to use frozen chicken as the taste would not be the same. Additional chicken feet for preparation of chicken stock (may be SGD 1 for 10 chicken feet) and keep the chicken fats for frying the garlics and gingers. One cube of ready made chicken stock (optional). Lots of garlics, gingers and bits of fresh turmeric (optional). 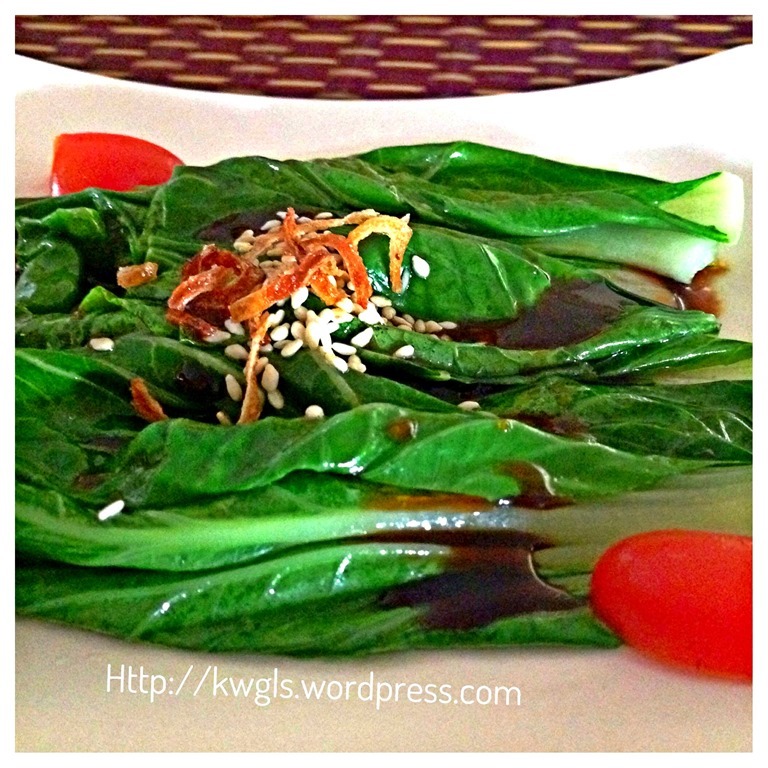 2 bundles of pandan leaves. It is definitely recommended if you are in Malaysia and Singapore but if you cannot get it in your countries, you can go without it but use more gingers and garlics instead. Some coriander leaves, tomatoes and cucumbers for garnishing. Pound the garlics and gingers as fine as possible. Add in a bit of tumeric if desired. 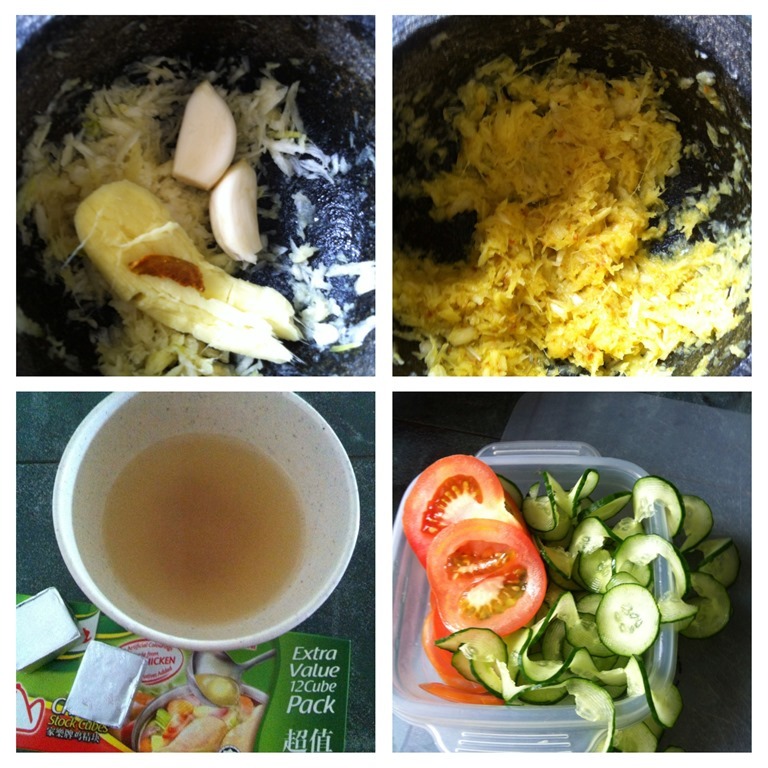 Set aside of future use.Note that I have included a small slices of tumeric for the purpose of colour the rice. Tumeric is a good colouring agent and in fact, it blends quite well with ginger and garlic. You can see from the second picture that the pounded mixture is a big yellowish. But do not add too much until it covers up the fragrance of garlic and ginger. In a bowl, get ready some chicken stock cubes, dissolved in hot water and set aside for later use.This step is optional but I opt to do it because I need not to add a lot of condiments such as light soya sauce, salt etc. to the chicken rice later. Sliced some cucumbers and tomatoes and set aside for later use. 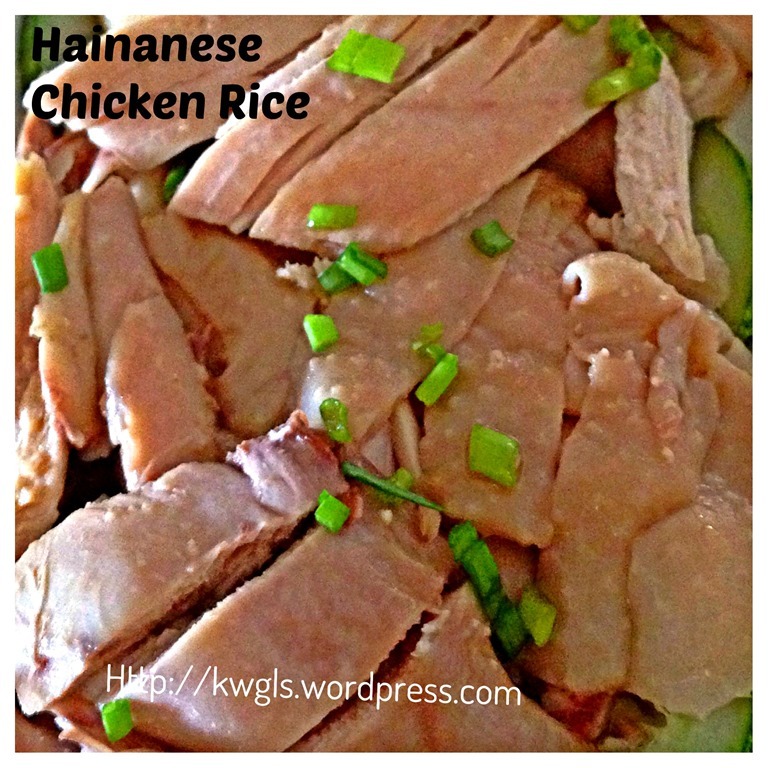 Personally, I would think that a plate of chicken rice is incomplete without slices of cucumber in it. 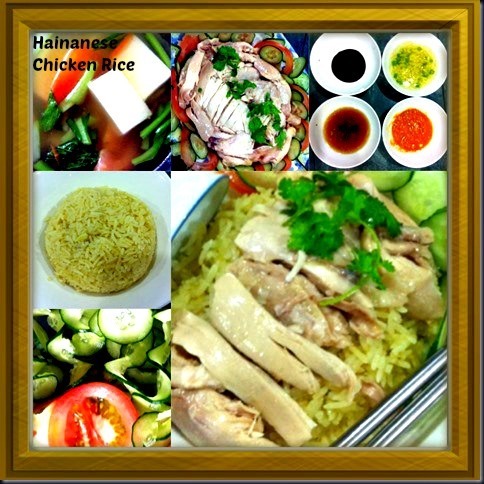 The role of cucumbers and tomatoes is to negate the greasiness of the rice and chickens since it is just “chicken plus rice” without any vegetables. 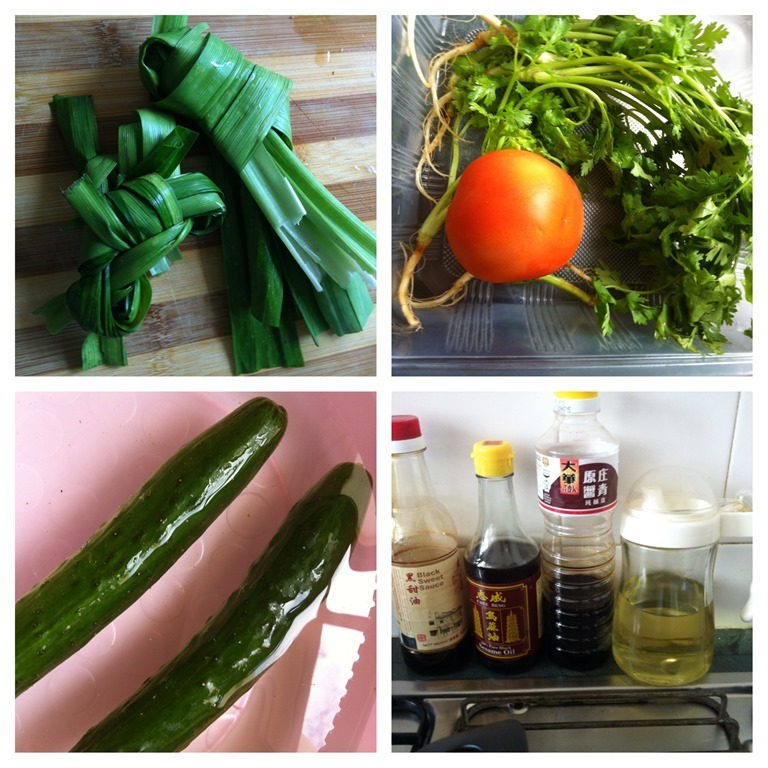 Size and shape of cucumber are up to individual and here, I have sliced it into funny shapes for future garnishing. 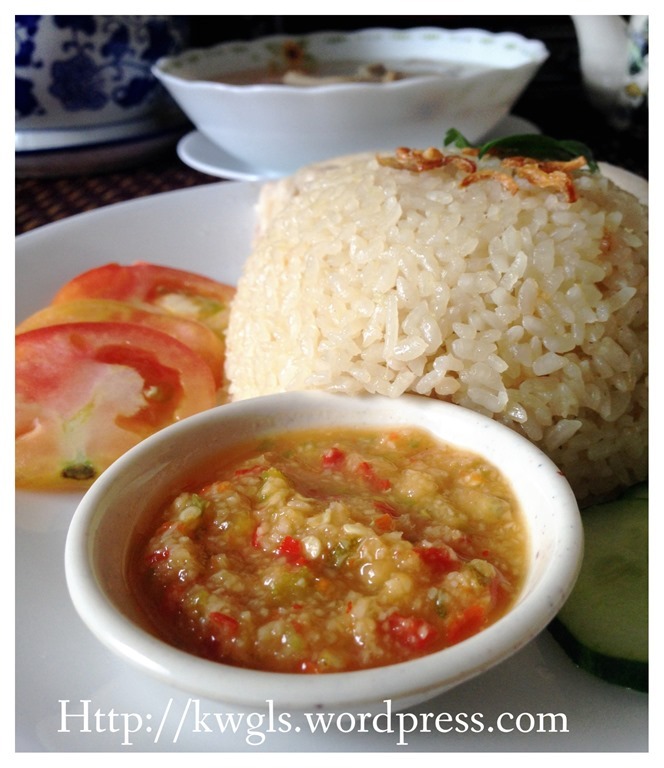 Tomatoes are optional but I love the colour and it blends well with the chicken rice. Clean the chickens and pluck off any feathers and hairs found. Chop off the heads and legs. The legs can be used for preparing the chicken stocks. If any chicken fats were found, wash and keep these fats for future use. You may consider to use coarse sea salts to rub on the chicken skin such that you have a smooth polished chicken skin. I did not perform this step as I did not have any coarse salts with me. I have purposely bought some additional legs for the preparation of chicken stock as I found that one chicken is just not adequate to bring out the fragrance of the chicken rice. The garlics and gingers quantities in this picture were for reference only. Get ready a pot of water. Throw some garlics, gingers, pandan leaves and bring to boil on high heat. 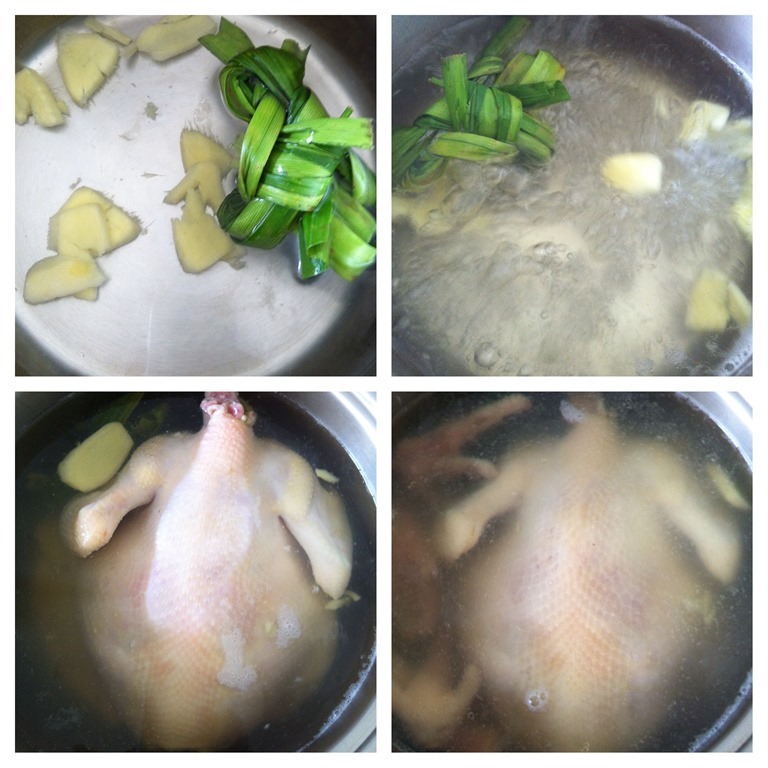 When the water is boiling , submerge the whole chicken into the water with its back facing up. Add in the chicken bones and feet. 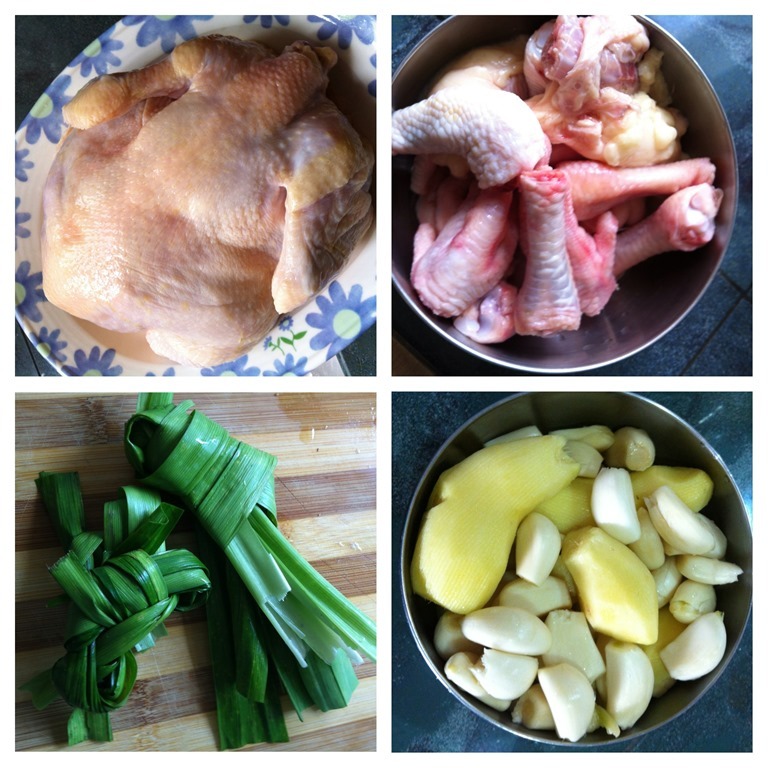 You can also consider to stuff the chicken with the garlics, pandan leaves and some spring onions before you poached the chicken. The reason letting the chicken having its back facing up is because chicken breast takes longer time to cook and positioning chicken this way will ensure that breast are fully cooked. After 30 minutes, get ready a big pot of cooked cold water (icy water preferred). Take the chicken out and put it in the cold water. Let it soak in the cold water for about 15 minutes. The most important reason for doing this is to preserve the meat juices in the chicken from drying out and prevent the skin from breaking. Use some type of measuring cups (be it the cooking measuring cups or your rice cooker cups) and pour adequate quantities chicken stocks (from simmering/poaching the chicken earlier) to the rice and ensure that it is just adequate to cover the rice. Add in the pounded ginger garlic paste and turmeric and stir until well mixed. Note: How much liquid (in this case chicken stock) is needed to cook the rice is very much depends on the types of rice you have. Some rice may need more water to cook than the others. On the rice cooker and when cooked, fluff rice gently with chopsticks (while loosening rice and avoid rice burnt at the bottom of the rice cooker. Leave at “keep warm” settings for about 10-15 minutes and a plate of chicken rice is ready. Get ready a bowl, add some light soya sauce, sesame oils, and a bit of leftover chicken stocks and mix well, set aside. Cut your chicken into parts, arrange on platter over a bed of sliced tomatoes and cucumbers. 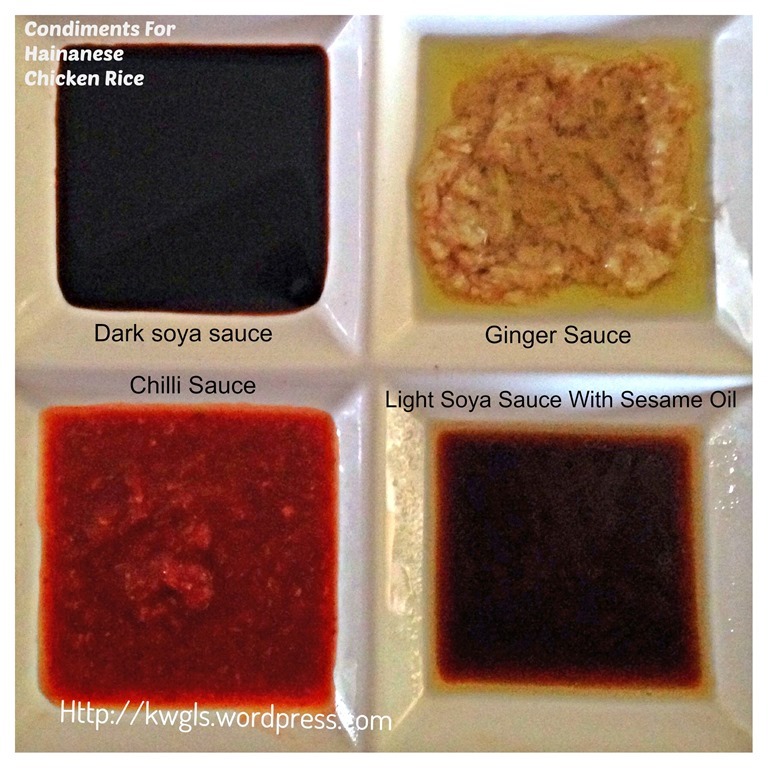 In separate condiments bowls, serve chilli sauce, ginger sauce and thick soya sauce as dips. Serve with warm rice and some chicken soups. There should be some chicken stocks left after you used it to cook the rice. 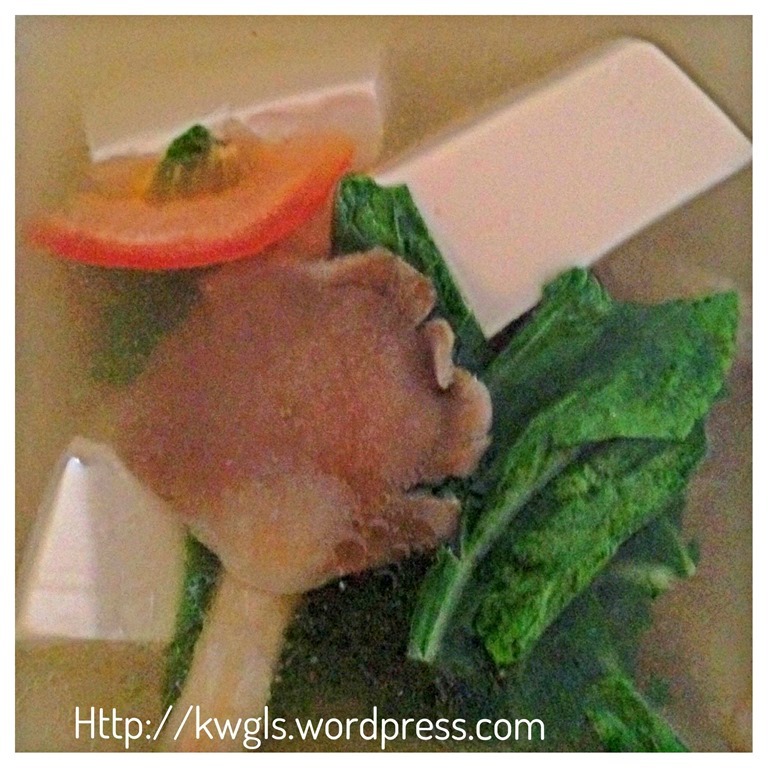 I just throw in some tomatoes, chye shim, and tofu to make some soups for my kids to eat along with the rice. 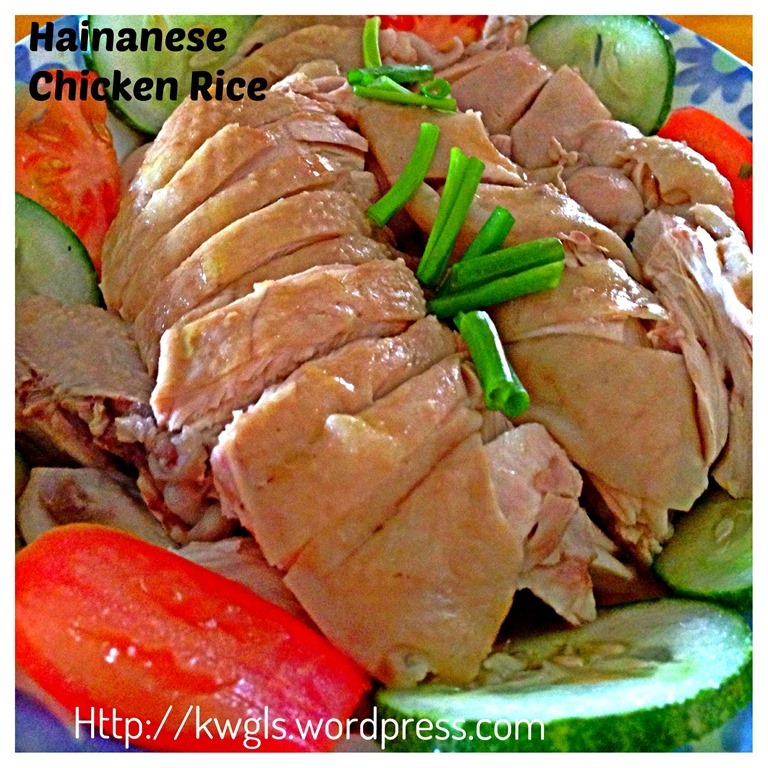 Here is the chicken rice and does it look appealing to you? Overall, I think I spent less than SGD 10 for the entire dish for a meal of 4. This price is not adequate for you to have a plate of chicken rice at a posh restaurants outlet. At a local food court, if we order one whole chicken plus four plates of rice, one plate of vegetables, plain chicken soup, you will need at least SGD 20 to have that. We can’t really finished the meals and we still have half a pot of rice left and about one third of chicken left. I used the left over chicken “stock” from submerging the poached chicken in the ice water, throw the chicken rice, the meat into the water and boil for about 15 minutes. Add condiments and garnished with fried onion, coriander leaves and chopped onion and a bowl of chicken porridge is ready for breakfast. 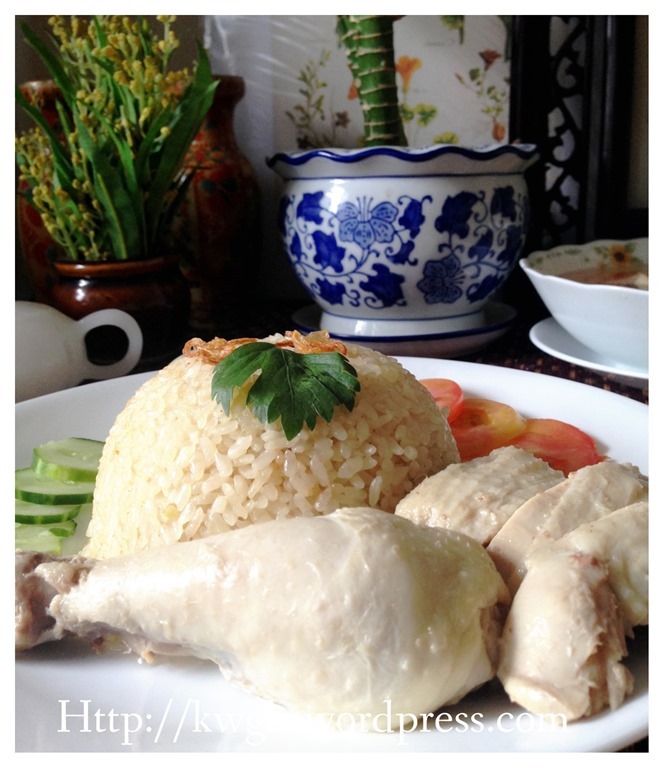 WHY NOT COOK SOME CHICKEN RICE FOR YOUR MOTHER THIS MOTHER DAY? IF YOU CANNOT COOKED FOR HER, WHY NOT FORWARD THIS POST TO HER AND SAY. Mom, You’ve cooked for me with love all this while and how I wish I could prepare this dish for you this Sunday to assure you that your kid have grown up and able to take care of themselves. 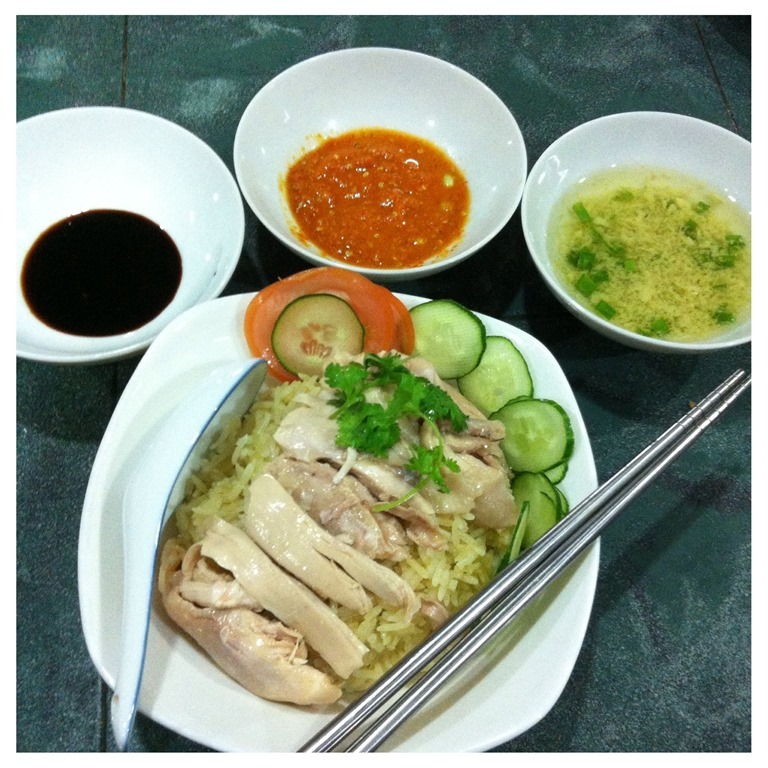 However, since I am not free to cook this Sunday, why not we have the most famous Chicken Rice in Singapore at the famous Mandar…. Hotel in Orchard Road instead? Mom, I love you….. “ Just joking!!! 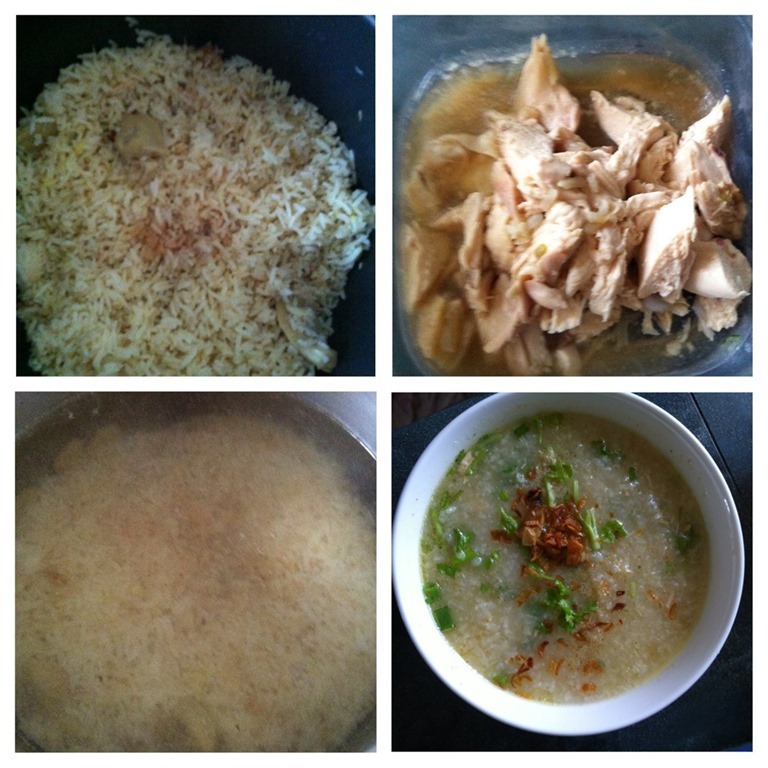 The post was updated with incorporation of some new pictures and preparation of chicken rice chilli recipe. 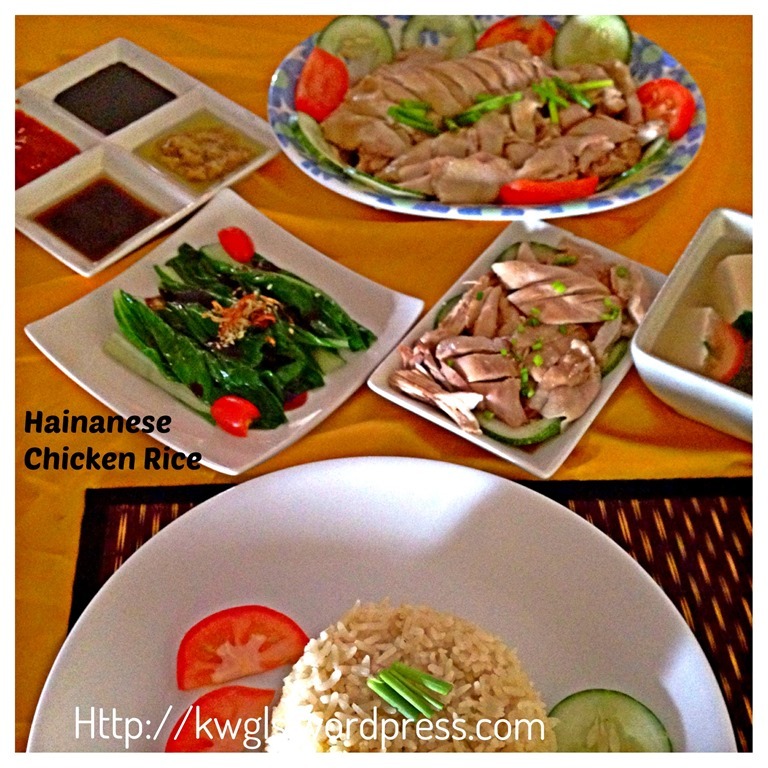 This chicken rice recipe is the one we usually prepared at home and if this is served, no separate ginger sauce will be prepared. All quantities are estimated quantities for reference only. Feel free to change to your liking. Squeeze the juice of the calamansi and keep the calamansi skin. 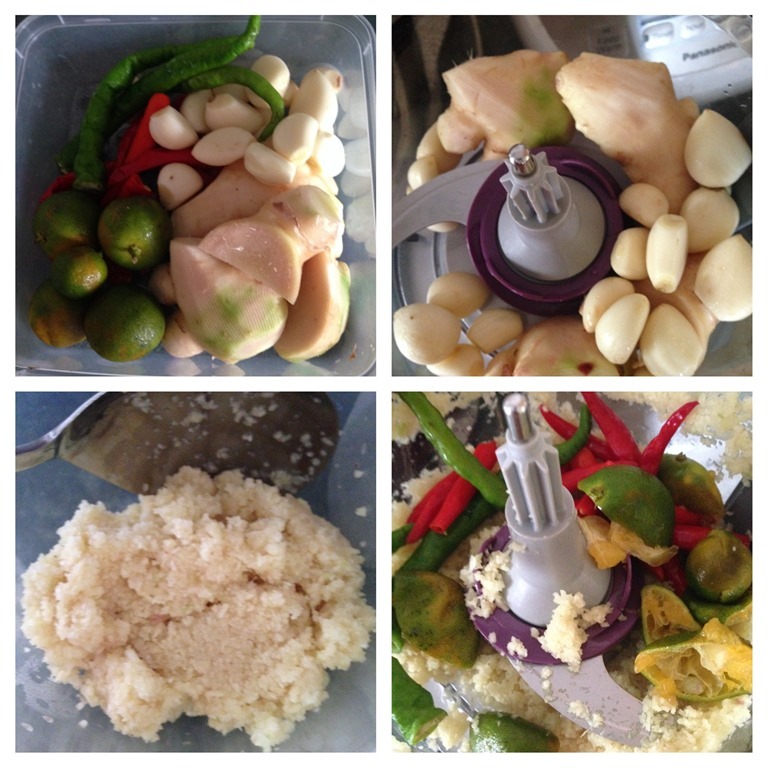 In a food processor, blend the gingers and garlics until fine. Add calamansi skin and chilli, blend until as fine as possible. Transfer the blended mixture to a glass bottle. 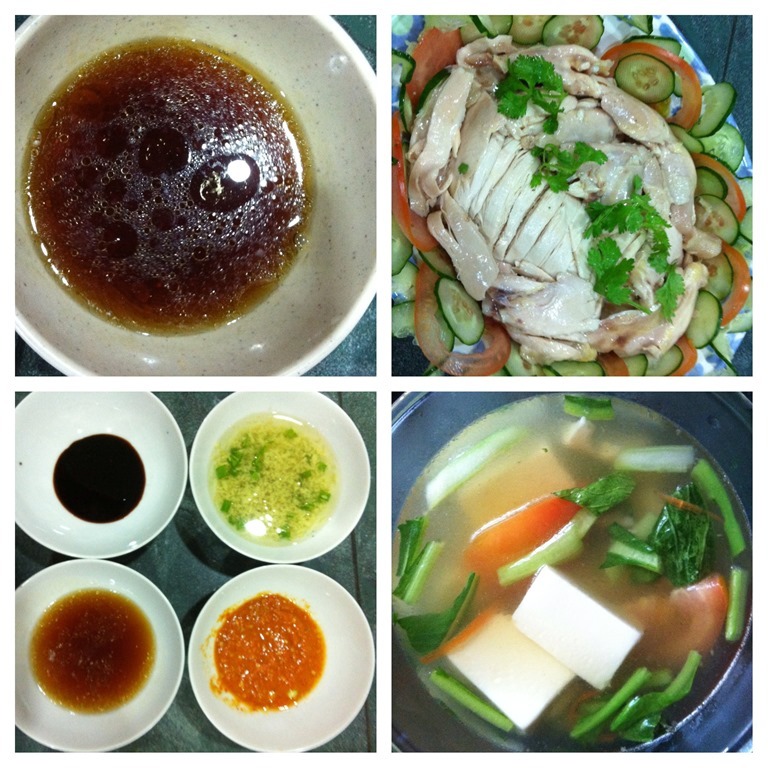 Add the calamansi juices, some white vinegar, salt, sesame oil, sugar, light soya sauce and chicken stock. Stir until well mix. Since this is a savoury sauce, feel free to adjust the quantities to your liking. Add more vinegar or calamansi juices when served in a small bowl. 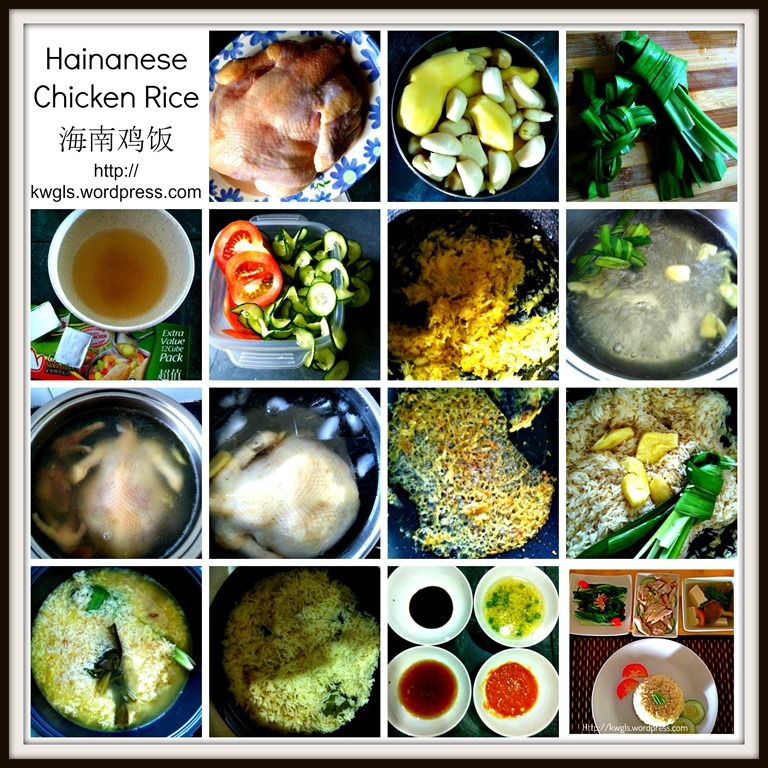 This entry was posted in Food Preparation Series, Noodles, Rice and Others and tagged 8, Chicken Rice, chinese cooking, Chinese meals, COMMON DISH, hainanese chicken rice, HOUSEHOLD COOKING, malaysia, postaday, singapore. Bookmark the permalink. What a detailed post! 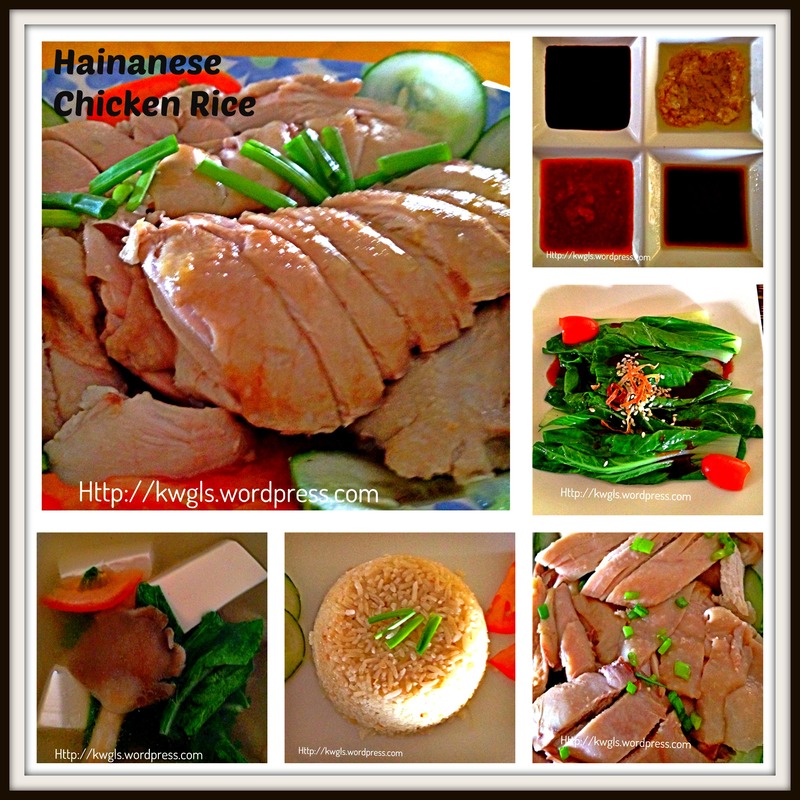 I was just sourcing for chicken rice recipes but I have bookmarked yours. You should be proud of this. Will let you know how my chicken rice turns out! This is an amazing post! I love the way how you do every step and show how to do it also. Congratulations! You really should continue doing food posts. Looks perfectly prepared – you really do know your stuff! Thanks for joining in with #recipeoftheweek – I’ve pinned this recipe 🙂 There’s a fresh linky live at the moment, so do please pop over if you haven’t already! The chicken rice is great… just one question i may have missed reading somewhere in the line about the garlic-ginger-tumeric paste.. where do you use it ? These are supposed to be used for stir frying the rice before the rice was transferred to the rice cooker. ok thanks got that ! Ok, future use – for what? Are this the ingredients for the the ginger-sosse? I am sorry for the oversight, the ginger and garlic paste plus turmeric are supposed to the saute and add to the rice before transferring to the rice cooker. Thanks for highlighting.